Each route is assigned a driver and managed separately. 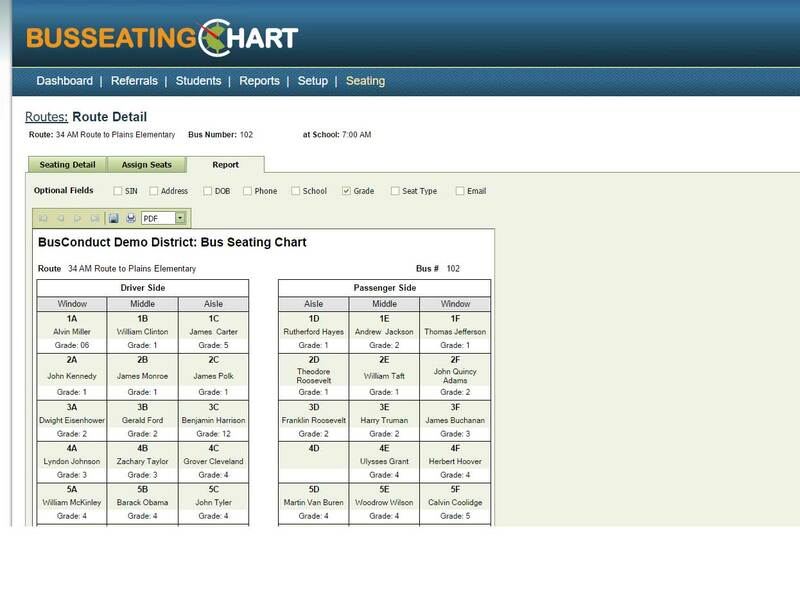 Only the assigned driver and school administrators can see and manage the seating chart for a given bus. Routes and rosters can be imported from your existing routing system. Assigning students to seats is a quick and easy process. 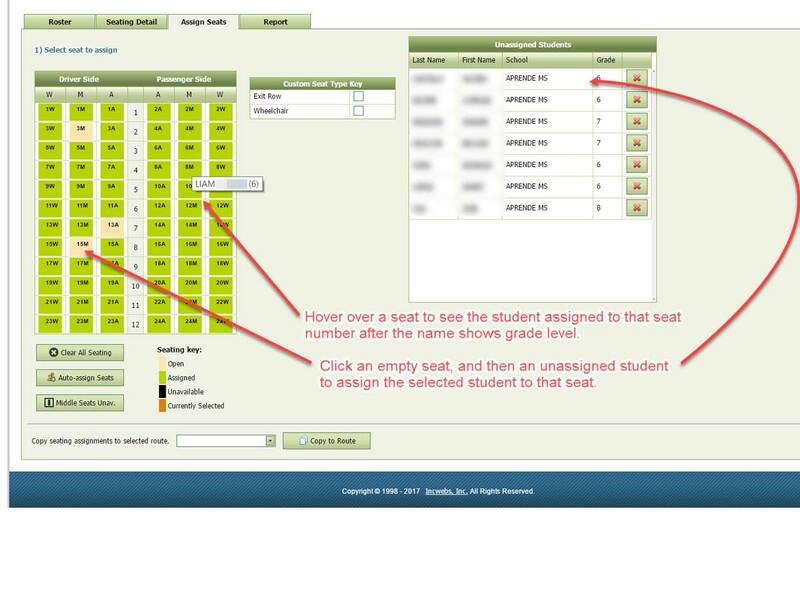 Select the seat from the visual diagram and click the student from the list of unassigned students. Once selected students are assigned, the remaining students can be automatically placed in the remaining available seats. Moving students between seats is quick and easy and the results immediately available to all concerned parties. 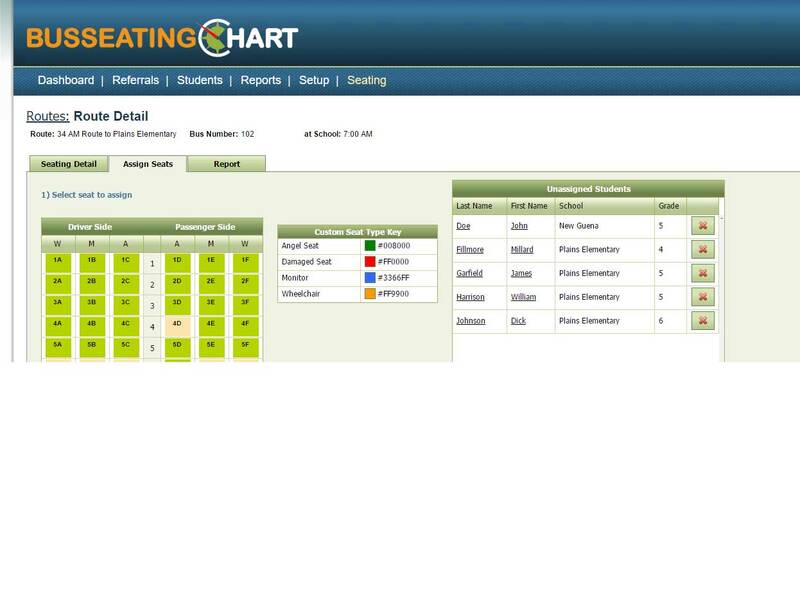 Seating chart reports allow uses to printout seating charts that visually represent the seating assignments. Users can choose what information is display on the report, selecting from availalbe values recorded for each student in the system. More complete reports like this on can include contact info for parents. 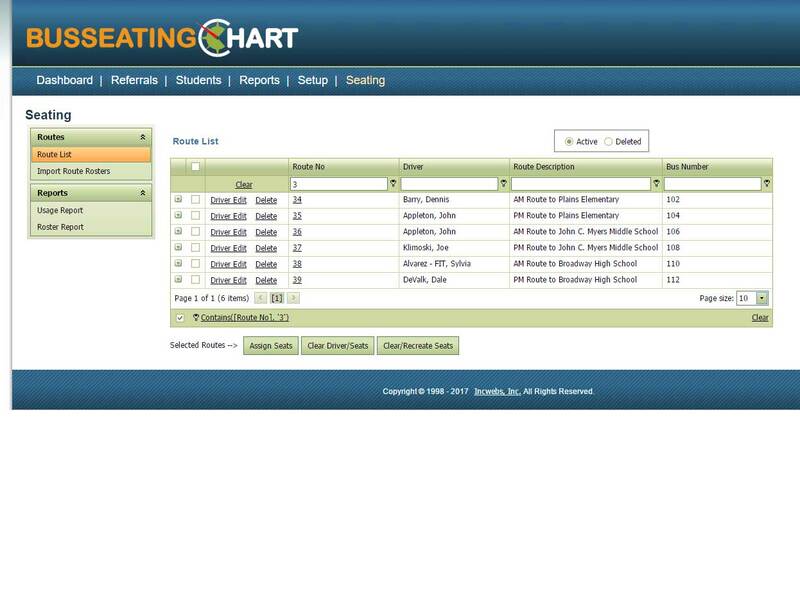 Seating chart reports allow uses to printout seating charts that visually represent the seating assignments. 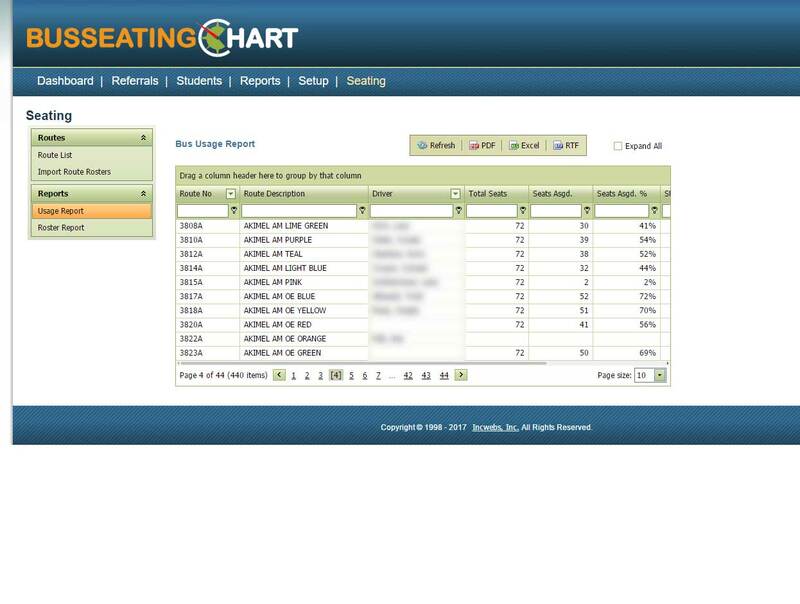 Users can choose what information is display on the report, selecting from availalbe values recorded for each student in the system. Simple reports like this one allow for a more compact representation of the students on the bus. 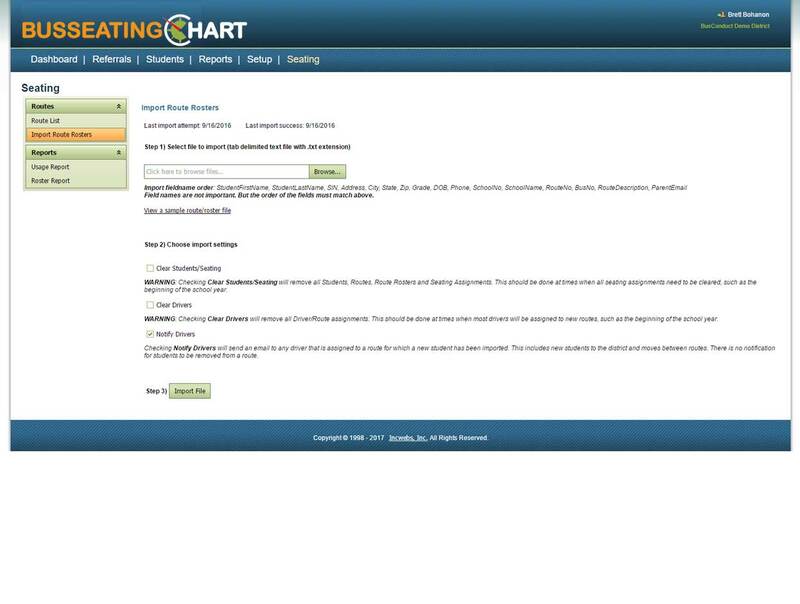 The usage report allows transporation officials to easly monitor which drivers have completed seating charts for their routes and take approprate followup action where necessary. Student and route data can be imported periodically from your existing routing system. Larger districts may choose to use the automatice import feature to update students and rosters daily. 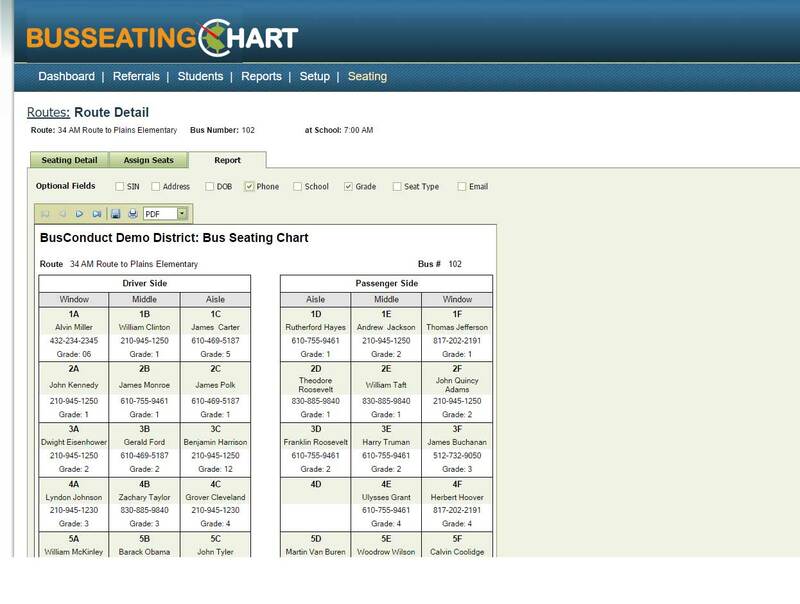 For smaller districts without dedicated routing system, BusSeatingChart can replace some aspects of a dedicated routing system, ask us about these optional features. Assigning seats on the visual seating charts is quick and easy, just follow these simple steps.